Ray Marshall Center staff, including Ascend 2-Generation Fellow Dr. Chris King and Cynthia Juniper, have been engaged in research on 2-Gen antipoverty efforts for more than a decade. The work began with program design efforts for the Community Action Program of Tulsa County with colleagues at Harvard to provide low-income parents and children simultaneously with high-quality human capital and related services. 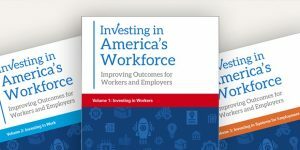 CareerAdvance® was piloted in 2009-2010 with support from the George Kaiser Family Foundation before securing 10-years of funding from USHHS’s Health Professions Opportunity Grant (HPOG) program. The evaluation of CareerAdvance® continues through 2020 with colleagues at Northwestern, NYU, Columbia and Oklahoma State University. In 2015, King and UT emeritus professor Aletha Huston convened a group of thought leaders and funders from the community, including United Way for Greater Austin (UWGA), to craft a 2-Gen Vision for Austin. United Way subsequently stepped up to become the “backbone” organization for a 2-Gen collective impact initiative for Austin that has received generous support from the Michael and Susan Dell Foundation for an intensive strategic planning process that culminated in the release of the Family Opportunity Roadmap: Austin/Travis County 2-Generation Strategic Plan, 2019-2023 in mid-December. 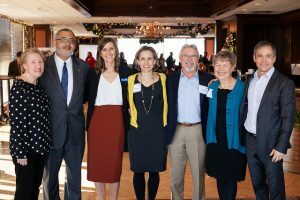 King and Juniper were among other leaders of the initiative at the launch of the community-wide strategic plan on December 13th in Austin. To view video from the event, see the UWGA’s YouTube Page. To view photos from the event, see their Flikr Stream. L-R: Sue Carpenter, CPO, United Way for Greater Austin; Jeff Travillion, Travis County Commissioner, Precinct 1; Carinne Deeds, Director of 2-Gen & Financial Stability, United Way for Greater Austin; Cathy Doggett, Planning Consultant, United Way for Greater Austin; Dr. Chris King, Senior Research Scientist, Ray Marshall Center, University of Texas at Austin and 2-Gen Advisory Council Co-Chair; Dr. Aletha Huston, 2-Gen Advisory Council Co-Chair; and David C. Smith, CEO, United Way for Greater Austin. King and Juniper are continuing their engagement in 2-Gen efforts in Austin and Tulsa. On November 9th, Director Dr. Heath Prince facilitated a presentation by Associate Director Dr. Greg Cumpton on Propensity Score Matching (PSM) at the Texas Evaluation Network‘s second evaluation institute. Held at the First Baptist Church of Austin from November 8-10, 2018, the Fall 2018 Evaluation Institute brought together people who are interested in learning more about evaluation, program staff who want to learn how to do evaluations in their organizations, evaluation professionals who want to improve their skills in evaluation, and anyone who wants to network with others who use evaluations to improve lives, communities, and organizations. Dr. Cumpton’s presentation was part of a 3-hour long session providing attendees with the basics of PSM, equipping them with tools sufficient to begin using PSM at their home agencies and organizations. You can view the presentation here. RMC researchers Dr. Heath Prince and Ms. Ashweeta Patnaik attended the American Evaluation Association‘s annual conference in Cleveland, Ohio. This year’s conference, Evaluation 2018: Speaking Truth to Power, was held at the Huntington Convention Center of Cleveland from October 29th through November 3rd and brought together evaluators, evaluation scholars, students, and evaluation users from around the world to assemble, share, and learn from the successes of the international discipline and practice of evaluation. Dr. Prince and Ms. Patnaik participated in a panel on November 2nd on Assessing Exit: How to Gauge the Capacity of Local Community Development Efforts to be Self-Sustaining. Dr. Prince chaired the panel while Ms. Patnaik presented and discussed RMC’s Review and Redesign of the Leadership Sustainability Index for Nuru International.